were designed. Before, they were made primarily of wood. Tennis racquets made of wood would break more easily. Today's rackets are a lot more durable. Today's players seldom use the traditional stroke. Instead, the majority of the top amateur and professional players impart more topspin. Changes in the technique have been attributed to new racket designs. Rackets are bigger, lighter, and stiffer than the traditional wooden rackets allowing the players to hit the ball with more power and control. These changes in have influenced the type of grip, footwork and racket backswing and forward swing of today's tennis players. For the beginner, the eastern grip is the easiest to learn. The eastern forehand grip is very popular among recreational players. It is sometimes referred to as the "shake hands" grip because the grip is attained by shaking hands with the racquet while the racquet face is perpendicular to the ground. This grip is effective for forehand groundstrokes with or without topspin. The eastern forehand grip also provides for greater wrist stability and allows the players to achieve the proper racket orientation at impact regardless of ball height. 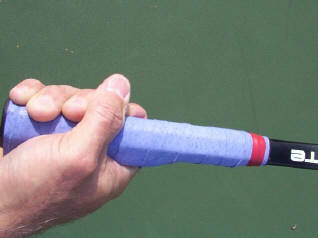 Most tennis professionals advocate the use of a western or semi-western grip instead of the traditional eastern grip. The western grips are preferred because it is easier to generate topspin and maintain racket orientation at impact. One disadvantage of the western grip is that it is difficult for players to hit low bouncing balls. Hold the racket in front of you in your left hand (or right hand if you’re a left-handed player). Rotate the racket so that the face (strings) of the racket is perpendicular to the ground. Lay the palm of your free hand flat on the face of the racket. Move your palm toward your body, down the shaft of the racket, until it hits the end of the handle. Wrap your fingers around the handle and space them slightly apart. Your thumb and forefinger should lie almost directly on top of the handle, forming a V that points toward your right shoulder (toward your left shoulder if you're left-handed). Your thumb should lie across the top of the handle. There are key elements in hitting the forehand. At first, you consciously think about all those elements in the process of executing this stroke but after much practice, you just do them without thinking. They become built in just like when you drive a car. After a while, everything is being done automatically. Your forehand stroke go into autopilot. Your success in tennis depends upon how you incorporate footwork in your game. The importance of footwork cannot be emphasized enough. I used to watch Chris Evert> play and I noticed that she was never late for the ball, she always had the right swing and it's because of her terrific footwork and I may add, total concentration. The same thing with Mats Wilander. He didn't have an overpowering stroke but he always put the ball in play and in well-placed spots enough for him to win several Grand Slam titles. At this stage, remember the words: Keep your racquet back!!! The ball had left the opponent's racquet, you move into position for the shot by running toward the ball or making a series of steps forward, sideways or back and during this time, the racquet goes back. 1. Recognize that the ball is going to your forehand side. 2. Establish a balanced sideways stance as you begin to position yourself for the stroke. Let go with your non-dominant hand. Keep this hand in front of you for balance. Your dominant hand will move back and lower. Racquet should be pointing away from your intended target. (Racquet Back) The tennis racquet should be at about waist height. Your dominant arm should be fairly straight but not locked. Establishing a sideways stance before the ball bounces is considered good preparation. Early preparation will be the key to all of your future successes. Late preparation will cause sloppy, haphazard slaps at the ball and will make the rest of the lesson useless! 3. Move into final position for the shot.Maintain enough spacing between your body and the ball to allow for a fluent stroke. Move you body such that you will be hitting the ball at waist height. Remember that the ball bounces, reaches the apex (max height) of the bounce and then descends. When the ball is descending from the apex and is at waist height is when you want to contact it. Super Tip - If the ball is below your waist bend your knees to lower your waist height. This will allow you to stroke the ball properly. 4. Accelerate (move) the racquet towards the ball. Keep the "head" of the racquet at the same height as your hand as you initiate your stroke. DO NOT bend or straighten your arm. DO NOT move your wrists. Begin to rotate your shoulders while keeping your eye on the ball. 5. Make contact with the ball. The point of contact should be somewhere around your front foot. The "face" of your racquet must be square to the ball at contact. ROTATE your shoulders through contact. This will allow you to keep your racquet face going in the direction of your intended target. Envision hitting three balls in the direction of the intended target as you sweep your racquet across the hitting zone. After making contact with the ball, the follow-through phase becomes critical as it will ensure that the prior phase of your swing was executed in a smooth manner. Similar to the backhand, the correct follow-through for this stroke will be an arcing motion that will rise from the point of contact with the ball to an area just above your opposite shoulder. The smoother your follow-through, the smoother the prior contact phase becomes. A more powerful forehand swing is never consistently produced by mere brute force, but through the smooth execution of the stroke time after time. Lift the ball over the net while keeping the arm and wrist in a relatively fixed position. Finish the shoulder rotation. Your chest should be facing your intended target. Your racquet face should remain perpendicular to the ground through the follow through. Your rear toe should remain planted while the heel raises off the ground. Lifting your rear foot will result in a poor follow-through. There you have it - all the essential key elements of this stroke but you need practice, practice and more practice to have an accurate, powerful and consistent forehand. A good way to hone this stroke is by hitting against a concrete wall (usually there's one at a school if it has tennis courts as well). Find out how to develop mental toughness to win more games and matches. Achieve dramatic results with Mind Training: to further develop and improve your forehand. The Forehand Fixer helps players efficiently use the entire body for maximum power and control. Alongside ground forces (bending the knees), body rotation is essential for a better forehand. The Forehand Fixer guides beginners to "feel" correct biomechanics right from the start. Intermediates looking to improve will gain a faster "feel" for the correct swing. Also reinforces optimal technique for advanced players. Let the game's most brilliant players and coaches teach you World-Class Tennis Technique! You'll find the most up-to-date information, based on solid scientific principles and presented in a practical, easy-to-understand manner. No other book on the market offers the level of world-class instruction and expertise found here. World-Class Tennis Technique is written by some of the world's top experts in biomechanics, tennis technique, and coaching, including: Patrick McEnroe Jim Loehr Mary Joe Fernandez Stan Smith Tom Gullikson Pam Shriver Former world-class players National coaches Past or current Davis Cup Captains Together these venerable tennis pros present a detailed, comprehensive look at the optimal biomechanics and technique for playing tennis including: perfecting your strokes, improving your footwork and positioning, training the appropriate muscle groups, choosing the right racquet and equipment for your style of play, adjusting to different court surfaces, maintaining proper technique under pressure, and analyzing your own game. About the Author --- Vic Braden is one of the most recognized tennis instructors in the world. Braden has authored five books, produced countless videos, and hosted several television series.